A man who was arrested after police found dismembered bodies in his flat has confessed to killing nine people over two months, Japanese media say. 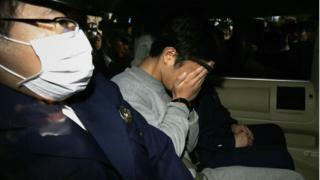 Police had found two severed heads, and the body parts of seven others, at Takahiro Shiraishi's home on Tuesday. The 27-year-old reportedly said he cut the flesh off the bodies to dispose of them and put cat litter over the remaining body parts to hide them. Japanese police say they plan to file multiple murder charges. Police had found two severed heads in a cold-storage container outside Mr Shiraishi's flat. They also found the body parts of seven other people, also stored in cool boxes, in his apartment. On Wednesday, more information emerged about the suspect. Police sources told local media that he found his victims on Twitter and say they suspect he killed them on the day that they met. Investigators are cited as saying there had been three cooler boxes and five storage boxes containing nine heads along with a large number of arm and leg bones. Police are still trying to identify all the victims but the discovery at his flat was made as police were looking into the disappearance of a young woman. They said she had gone on Twitter looking for somebody to take her life with. According to media citing police sources, Mr Shiraishi had found most of his victims that way - using Twitter to look for people wanting to commit suicide. He then invited them to his place offering to help with their suicides. Reportedly, Mr Shiraishi had been arrested earlier this year for introducing a woman to a night club knowing she would be made to work as a prostitute there.